My Review: If The Final Frontiersman represents the “Yin” of outdoor stories, then Into the Wild represents the “Yang”. (1) Heimo Korth (The Final Frontiersman) grew up in a blue-collar family experiencing the violent anger of an alcoholic father. He took to the woods at an early age to avoid the anger at home. 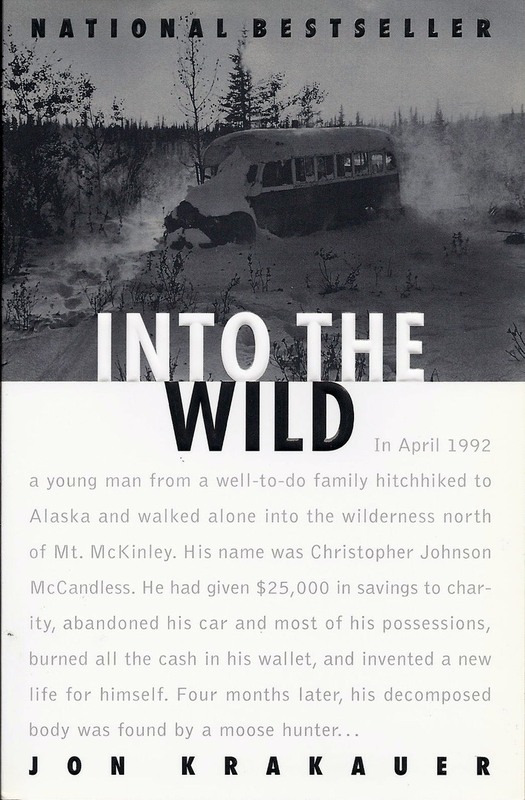 Chris McCandless, the focus of Into the Wild, grew up in a well–to-do Atlanta family, having money and privilege. Heimo had a first hand, practical knowledge of living in the outdoors. Chris held romanticized notions of escaping to the wild as a form of salvation. Heimo Korth learned and thrived in the Alaskan wilderness for twenty years. Chris McCandless died of sickness and starvation after only four months in a much less remote part of Alaska. I have read several of Jon Krakauer’s books and they are all great reads. This is no exception. Drawing on police reports, interviews and Chris’s own journals, Krakauer weaves together a complete story from widely dispersed bits of information. Pulling from highlights and margin notes in the books Chris carried, Krakauer paints a picture of a young man who rejects his roots for adventure and romantic ideas of living in nature. Chris has no background or experience to temper his romantic notions. Naming himself “Alexander Supertramp”, McCandless heads out in an old Toyota, making his way through the south, west and upper mid-west before heading for Alaska to go “into the wild”. Along the way, he abandons his car in the desert and gives away all of his savings, some $25,000.00. He lives by working odd jobs and hitching rides. Chris makes good friends along the way, but nothing seems to hold him. Eventually he heads to Alaska to test himself by going “into the wild”. Wilderness was to be his salvation. Yet in four short months it killed him. The story of how Chris McCandless gave up his privileged life, giving away all his worldly assets to live in trailer camps and work as a common laborer, is fascinating. Even more compelling is the tragedy that befalls his ill-fated expedition into the Alaskan wilderness. Krakauer does a masterful job of drawing on sketchy information, mixing it with conjecture and logical consequences to assemble a picture of McCandless’s final months and days. When Alexander Supertramp’s body is finally found by moose hunters, he has been dead for more than two weeks. This is a great book and a great read. It has been made into a motion picture, which is equally good. I recommend both.